Traveling into uncharted space, the Enterprise encounters a mysterious alien probe. When the probe poses a threat, Kirk is forced to destroy it, much to the ire of the apparently superior alien race that created it. The alien commander, Balok, subsequently sentences the Enterprise to destruction for trespassing in their space. The Corbomite Maneuver first aired November 10, 1966, and repeated May 11, 1967. It is episode No. 10, production No. 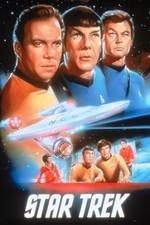 3, the first regular episode of Star Trek produced after the two pilots. The episode was written by Jerry Sohl, directed by Joseph Sargent, and features a young Clint Howard. The episode can be viewed on CBS, Hulu, and Netflix. This episode stuck out to me as one of the first which really show cased Kirk's ability and perspectives on being a captain of a federation starship. He highlights the ship's mission repeatedly and how it's their duty to follow it, regardless of the danger it might bring. He trains his crew when they're worn out and quips to a crew member that it isn't a democracy aboard the ship. Arguably (?) his decision to address the imminent destruction of the Enterprise as a game of poker and the bluff of the Corbomite maneuver revealed his coolness under pressure and refusal to accept defeat. I think this episode revealed the best of Kirk as a captain up to this point. Bailey, well, whenever we have an officer who've we have never seen before get inordinate attention, you know he's going to play some role. Kirk's decision to give him a second chance is also a great example of him listening to McCoy's advice. Bones isn't just there to complain about medical problems, he's played a significant role in the last couple episodes. This may be the best "sci-fi" episode so far. I'm still mixed over the last minute reveal of our tyke of an alien, whether it was silly, creepy, or both. I loved Sulu's chronological fascination! Also, we knew hte probe was dangerous because of the music that played whenever we saw it on the view screen. Eeeee! Hmm, I had hoped people would have more to say about this one. As I have stated in other Trek threads, "The Corbormite Manuover" is my favourte Star Trek of any kind. This episode is the real pilot episode and includes most of the elements that make Star Trek great. The approach of the Fesarius is still one of the greatest things I've ever seen on a screen of any size. McCoy's a good friend and advisor, but clearly not a 'military' man. Already, he's reluctant to get on transporter. "Ready, doctor?" "NO, but you wont let that stop you." I liked this early Spock, before Nimoy got too comfortable in the role. He's the efficient Exec and a different kind of trusted advisor. Despite a devotion to logic, it's clear he doesn't actually lack emotions, nor a sense of humour. Spock's human side is upgraded here from "one of my ancestors married a human female" (in "Where No Man Has Gone Before") to "[My mother] considered herself a very fortunate Earth woman". Spock's presence here shows we've done OK with alien encounters. "Balance of Terror" makes a nice counterpart to this theme. Scotty goes through a never repeated ritual of explaining to Kirk the nature of the device he's handing him: "communicator . . . phaser weapon". Since a lot of this is never repeated -- at least explicitly -- it's kind of a shame the network decided they wanted to debut the series with some planet-based stories first. "Corbomite" wasn't shown until November. The opening shot is re-used from first pilot, "The Cage", cut just before you could see the matte shot of the bridge through the dome. There were five different versions of the show's theme recorded in the course of the series first run. "Man Trap" used the rare "Electric Violin version"; "Corbomite" marked the first use of the "Cello version" -- no coloratura on this one. Speaking of music, The Spinning Cube Theme! Heavy on the mallets and low brass, please. This was written by Fred Steiner. The whole piece is about ten minutes long, and was re-used many times. Also shot for this episode and re-used many times is the captains-eye view of the screen with Sulu turning around to look at you. Because they took the bridge apart to shoot most scenes, the over-the-shoulder shot as Kirk enters from the turbolift is a treat. I believe the only other time we saw this perspective on the bridge was in "The Changeling" (NOMAD). Uhura's uniform is gold here and in "Mudds Women" (produced right after this ep) and never again. Star Trek's signature conintuity error occurs in this ep: Scotty and McCoy arrive on the bridge together and McCoy is wearing the standard velour uniform. But in all the subsequent one-shots he's wearing the shiny shortsleeved 'scrubs' uniform. This pattern would repeat throughout the series. Since DeForrest Kelly only had about three facial expressions, they probably did an afternoon of reaction shots (left eyebrow up, right eyebrow up, both eyebrows up, now do one with the toothy grin and bounce on the balls of your feet . . . ) to use and reuse forever and forgot that McCoy's the only character who gets a change of costume on a regular workday aboard ship. The signal continuity error of this episode comes when Sulu says: "One minute . . . I knew he would." Apparently this was to be Sulu anticipating a line from Balok -- "You now have one minute" or something. But the Balok line got left out accidently and Sulu's "I knew he would" doesn't make any sense. This is the first time Uhura utters her signature line "Hailing frequencies open, sir" and unfortunately, she has to deliver it no less than seven times in this one episode! No one takes the place of Bailey between his freakout and his return to 'die with his (zip-up, calf-length) boots on'. There's no navigator / weapons officer on-duty for almost seven minutes. By way of contrast, in "The Naked Time" Kirk order Yeoman Rand -- no kind of bridge officer -- to take the twice-abandoned helm. Kirk and McCoy are drinking something blue. Romulan Ale already? They haven't even met the Romulans face to face yet! The black market is certainly efficient in the 22nd century. P'raps Cyrano Jones had already made contact. Balok's alter-ego is a neat trick the producers played on the home audience. They never tried to make him look realistic at all, despite wanting you to believe in the technology that created the Fesarius. So you think, "Oh, here's another fakey alien monster on the teevy, it just looks like a 'scarey' puppet. Well, yeah, as it turns out. . . . The end of act III may be the longest period without dialog in the entire series. Maybe they needed to pad out the ep to get it to full length. Around my house, we've been calling grapefruit juice 'tranya' for almost fifty years. I wonder why Kirk, McCoy, and Bailey assumed that if it's not poisonous to Balok, it's not poisonous to them. You know that's Ron Howard's brother Clint, right?